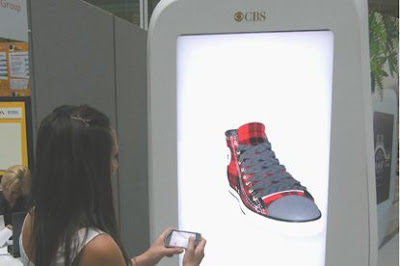 CBS Outdoor and Clusta have designed digital billboards which can connect to your iPhone via WiFi or 3G, allowing you to rotate and zoom the products on screen with the touch-screen by using the "pinch" and "stretch" features on your iPhone. It’s the ultimate combination of “connective ubiquitous technology” and “making people stare at pictures of products for even longer”. It’s certainly a great advance in mass-market interactive technology and we’ll have to wait and see if it ever gets used for local news alerts, public information, or anything at all except selling stuff. The technology can also be developed for other smart phones and can include SMS interactivity to receive more information about the product.